It may not be the most glamorous locale for a private island, but this large property in the Ohio River generated plenty of interest when it was auctioned on November 17th. The 1,468 acres of Diamond Island harken back to an earlier time, when private islands were regarded less as retreats for wealthy celebrities, and more as excellent grazing pasture where the cows can’t make a break for it. 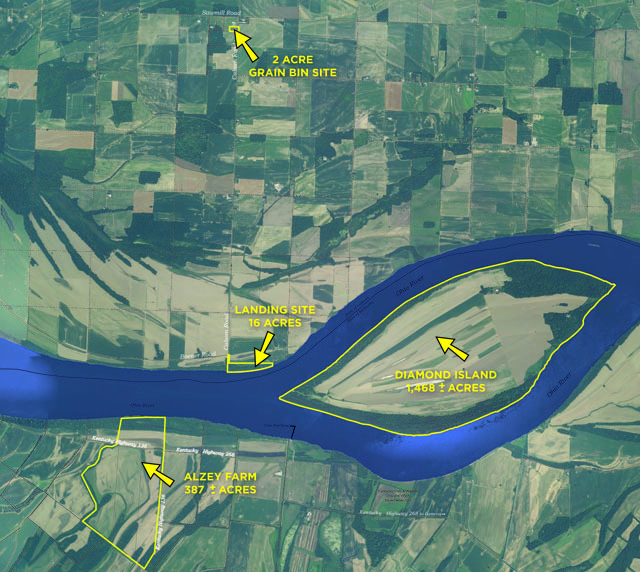 There probably won’t be a luxury resort springing up on the island, which sits in the Ohio River in Kentucky – coming complete with a ferry landing and grain bins on the mainland, Diamond Island has a far more valuable use as highly productive farmland. The island’s interesting history, full of local pioneer-era lore, only adds to the attraction of this unique property. And the island brought plenty of people out to the auction – according to Jason Blue, an employee of Kurtz Auction and Realty, there were upwards of 200 people in the audience at Henderson Community College, and there were dozens of registered bidders from both Kentucky and neighbouring Indiana. The buzz wasn’t for nothing, as the island and its accoutrements ended up netting an impressive US $6,092,200, or $4150 an acre, according to local media reports. The buyer was the locally-based Maple Land Company, and according to the auction company, there are plenty of ways that the island could offer a good return on investment. In an article in Kentucky’s Courier Press, numerous ideas were suggested by the auction house; aside from the current grain and soy farm, there could potentially be income from oil, hunting leases, or leasing the islands’ shoreline as storage for barges. The two partners of Maple Land Company, Ray Rexing and Mike Braun, were quoted in the article as saying that they intended to “…farm it, work with the present tenants somewhat and see what we can make it do.” The new owners have put down a 10% deposit and will have to pay the balance when the deed is delivered by December 19th. Diamond Island has a long and rather terrifying history that belies its somewhat ordinary-sounding status as farmland; like many islands in more exotic locales like the Caribbean and Indian Ocean, it was once used as a hideout for river pirates, like the notorious Samuel Mason in the 18th century, not to mention the much-feared highwaymen and serial killers, the Harpe Brothers, during the same period. In the early 19th century, Diamond also was the site of a reputed massacre of a family, perhaps including three missing children, by Native Americans. With plenty of skeletons in the island’s past, if their other ventures fail, the new owners could no doubt create a spooky tourist attraction sure to be a hit at Halloween.